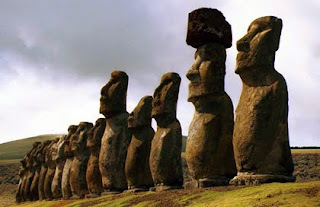 Easter Island (Rapa Nui in the indigenous language), is a Chilean-governed island in the south eastern Pacific Ocean. Rapa Nui is a small, hilly, now treeless island of volcanic origin. 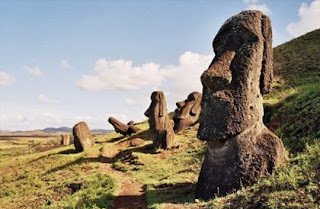 It's been called the most isolated inhabited territory on Earth, but there is another aspect that sets it apart from any other place on Earth - its hundreds of megalithic human-like statues that face inland from the shore. These enigmatic statues are called moai. Almost all moais were carved out of distinctive, compressed, easily worked volcanic ash. The largest one weights up to 165 tons, and its height is almost 22 meters. 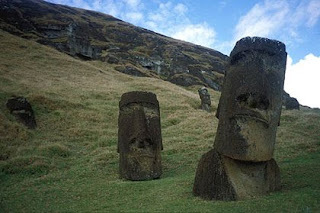 Some upright moai have become buried up to their necks by shifting soils.